Women’s prison dramas are the new black. While there is plenty of realistic women’s prison drama about at the moment it also turns out to be a pretty effective place to set a modern gothic horror tale. MR Carey’s follow up to The Girl With All the Gifts takes the reader into the high security wing of a private women’s prison set in foggy North Yorkshire. Into this mix he adds more than a sprinkling of the supernatural and stands back to watch the results. Jess Moulson has been accused of starting a fire which severely disfigured her and took the life of the young boy who lived in the flat above her. Addicted to heroin at the time, Jess sleepwalks through the trial, believing herself to be guilty and seeking punishment. Once convicted she is sent to the private, high security women’s prison Fellside. Once there, however, she is brought out of her personal fog by the intervention of a dreamlike presence assuring her that she was not responsible for the boy’s death and urging her to find his killer. It turns out that Jess has more power than just communing with the dead. She also has the ability to walk through and affect people’s dreams. As per usual in these tales, she expressed these powers as a child but had them psychoanalysed out of her at a young age. But with the help of her ghostly guide, she begins to take greater control of this power. All around Jess is a fairly typical women’s prison drama. This is the sort of action that readers may have encountered on television on series like Orange is the New Black, Bad Girls or Wentworth, the recent reboot of the Australian classic women’s prison drama Prisoner. The wing of the prison in which Jess is assigned is ruled over by a top dog called Grace who has the head warder Devlin (unsurprisingly nicknamed the Devil) in her pocket (and in her bed). Grace rules with an iron fist and with the help of a couple of brutal enforcers. Not satisfied, power hungry Grace is seeking to expand her drug importation and supply empire to the other wings of the prison. This aspect of the plot, along with many of the other prisoners, seems to have been transferred straight out of those aforementioned prison dramas. But the supernatural elements are used to shake things up in ways none of the characters can predict. And there is some interest to be had in characters like Jess’s lawyer Paul, the blackmailed doctor Salazar and his guilt-ridden nurse Stock. There is a little bit of everything here – prison drama, courtroom drama, psychological drama. 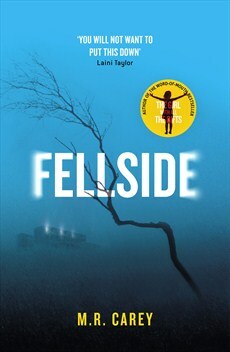 But in the end, Fellside follows many of the conventions of the classic gothic ghost story. And Fellside prison is a perfect setting for such a tale. While the prison might be ultra-modern (no dank corridors or rattling chains) violence and fear oozes from the walls. Much of the darkness, horror and tension comes from the inhumanity of the place itself and the way the inmates and staff are treated and treat each other. Fellside is a slow burn supernatural thriller. Due to Jess’s initial passivity and the large supporting cast, it takes along time to engage with the story. Patience and a little stamina is required. About two thirds of the way through, Jess develops a fair amount of agency, all of the plot strands and character machinations come together and Carey grabs the reader by the scruff of the neck. Fellside then barrels towards a not unexpected but in many ways surprising resolution.